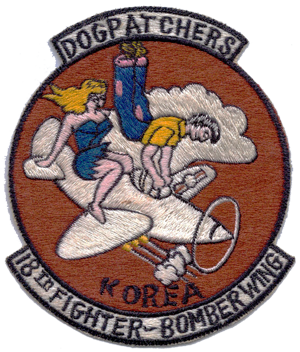 the Combat Diary of the 18th Fighter-Bomber Wing during the Korean War. Information and details about the limited number of hardcopy/softbound first edition books left in stock can be found on this page, as well as a link to order a copy. When these copies are in the hands of readers, the publisher has no plans to print additional hard copies. What is exciting, and is underway as we speak, is the conversion of this incredible combat diary covering an entire Wing during more than three years of air combat, into a digital publication. Because the hard copy publication was so large – more than 700 pages – and included so many large format and never before published images – more than 1,000- the digital conversion process will be lengthy. Follow the pilots and airmen of the 18th Wing, week by week, 65 years later as they battled to save South Korea from hordes of North Korean invaders. While the digital edition is being prepared, on these pages, BelleAire Press will publish excerpts and highlights from the unit and personal diaries of the squadrons, pilots and airmen of the 18th Fighter-Bomber Wing during its 37 months of air combat in Korea. Each week, author Capt. Tracy Connors, will post an expansive blog of highlights and excerpts of what these units and pilots were reporting during that week. Mission Briefings will provide you with important background information and images to help you better understand the men, the planes, the squadrons, the Wing and the war. Log Entries will provide a weekly overview of the type of combat challenges the 18th was facing – including never before published images, many from the pilots themselves. With data collected from official reports, many classified at the time, you will share the dangers, excitement, frustrations, and private nations of the pilots and air in of the numerous squadrons that comprise the 18th Fighter-Bomber Wing during that conflict. Mission Briefings and Log Entries will be illustrated with rare and often unpublished photographs of air combat operations during more than 62,000 sorties from June 1950 until the armistice was signed in July 1953. The weekly combat diary excerpts will also enable Capt. Connors to share photographs that could not be included in the hard copy publication due to space limitations. 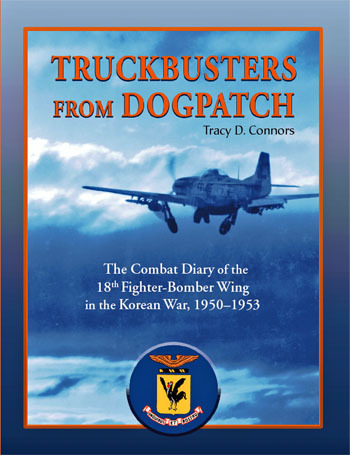 Truckbusters from Dogpatch, a remarkable, 712-page, true-life account of the U.S. Air Force’s 18th Fighter-Bomber Wing from 1950 to 1953, the time during which their heroic air-combat efforts flying F-51 “Mustang” fighter-bombers helped save South Korea from occupation by North Korean and Chinese military forces. Truckbusters from Dogpatch is the most comprehensive Korean War unit history yet prepared–over 700 pages summarizing squadron histories and first person accounts—and includes over 1,000 never before published photographs and images, highlighted by the 8 ½ x 11-inch format. Arguably, Truckbusters From Dogpatch is the most authoritative unit history ever prepared on the Korean War. In addition to consulting formerly classified squadron histories filed monthly throughout the conflict, the author was in touch with hundreds of veterans of the 18th—pilots and ground crew—whose personal recollections add vivid detail and emotion to the facts recounted in the official documents. See and hear Captain Connors explain why he wrote Truckbusters From Dogpatch.